Smokey - From 2-Year Old to 200"
This story actually begins back in 2004 when I shot a buck scoring 214” that quickly became surrounded in controversy. After shooting the buck I was accused of wrong-doing and had the buck confiscated despite the fact that I shot him 100% legally. To make a long story short, I had to hire an attorney and go to court to get it returned. Those who really knew me had no doubt that the accusations against me were false but I am sure there were others who weren’t sure what to think. At that time I made it my mission to shoot another buck scoring more than 200” but the next time I would do it on video to put all doubters to rest. This season, 13 years later, my goal was finally realized when I once again tagged a whitetail buck that topped the magical 200” mark and it was all captured on video. I shot this 214″ buck back in 2004 and then had it illegally confiscated by the Illinois Department of Natural Resources. I detailed the hunt for this buck and the legal battle to get it back in my first book. The buck that I would eventually call “Smokey” showed up on my property in 2013 as a tall-tined 2-year old with 9 points . Obviously he was safe on my farm and survived the hunting season to live another year. The next year the buck was 3 years old and his antlers grew so much that I didn’t even realize it was the same buck for quite some time after getting his first photos. When I did finally realize it was the same buck it became obvious that he was easily the best wild 3-year old buck I have ever seen. His wide-spreading rack had 11 total points including forked G-2 tines on both sides; a trait that later would become his trademark. He would likely have scored right at the 170” mark although I never found his shed antlers to know for sure. During the summer of 2015 I was anxious to get the first photos of the buck. If he made the same kind of jump in antler score that he had the previous summer, he would be really special. Unfortunately his rack was not a whole lot bigger and he only had the forked G-2 on one side. Again I gave him a free pass for that season hoping that he wouldn’t wander too far and get shot. The next spring I was burning a field of Real Worlds “Bedding in a Bag” with friends Joe and Jack Johnson when the fire jumped a firebreak and started burning an area of trees and shrubs that I had planted years earlier. As we fought to put out the fire I found both of the bucks shed antlers just as they were about to be consumed by the fire. On that day the buck earned his name … Smokey! Smokey earned his name in the spring of 2016 when I was burning a field of Real Worlds “Bedding in a Bag” with friends Joe and Jack Johnson. In 2016 Smokey added several inches to his rack mainly in the form of tine length. His rack was basically a 4×4 main frame with those deep-forked G-2 tines. I passed on 5 different opportunities to shoot Smokey that fall and captured all of them on video. He became the biggest buck I have ever let walk. When I found those shed antlers the next spring they taped out over 180”. A lot of people thought I was crazy for passing a 180” buck but I hoped that he might have another good growth spurt that would push his rack over 200”. The fact that he scored more than 180” with just one short G-4 tine is what really gave me hope. He had grown G-4 tines on both sides of his rack in the past, just never on both sides during the same year. If he would just put a nice G-4 on both sides I knew that would add 10-inches or more to his score. When I put out my trail cameras last summer I was anxious to see what Smokey looked like but also nervous about what I might find. I had let bucks scoring in the 170s live another year in the past and they never did put on the growth spurt that I had hoped. Would Smokey do the same? Or would he buck the trend and do what the other bucks never did? I was flat out fired up when I got the first photos of Smokey last summer and saw that not only had he put on good G-4 tines on both sides but most of his other tines were longer and his mass was a little better. I knew he would push past the 200” mark. I made a good attempt to get video footage of Smokey in velvet but was cautious not to push him out of the area. I saw him 3 times last summer but always right before dark, too late for video filming. One evening I hid amongst some pine trees and watched him feed in an alfalfa field for 20 minutes just 70-80 yards away. The sight of that giant velvet rack made it tough to sleep for several nights. I knew exactly where my best odds of killing Smokey were and already had a blind in place. I even had a food plot in front of the blind which I planted to Real Worlds Deadly Dozen blend in late August. All I had to do was wait for opening day and a northwest wind. As luck would have it, we had southerly winds the first 10 days of season. On October 11 we finally got the needed NW wind so I slipped into the blind with good friend Kyle Heuerman of Team Radical Outdoors. Kyle was going to run the video cameras. We almost pulled it off as Smokey did exit the field of bedding grass that evening but instead of moving our direction towards the food plot he went the opposite direction. Kyle did get some great video footage of Smokey however. On October 15 we again got the NW wind we needed to hunt the blind. With about 20 minutes left before quitting time I saw the tall grasses moving as a deer was headed towards the foodplot in front of the blind. As I looked through my binos I could see antler tips so I knew it was a buck. A few seconds later he stepped from the tall grasses into the edge of the food plot. It was Smokey! I grabbed my bow as Kyle filmed Smokey feeding in the plot and working his way along the edge towards us. When he stopped 25 yards away I sent an arrow through his chest. He ran down the Real World clover & chicory firebreak and stopped just 80 yards from us. We could see the blood pouring from his side for a few seconds before he stumbled and fell. It was over. For 13 years I had been on a mission to kill another 200” whitetail on video and now it was done. It was a feeling unlike with any other buck I have ever shot. I knew exactly how rare and special this moment was. Instead of rushing out to see Smokey and grab that giant rack, I called my dad to come and help. I really didn’t need the help as much as I needed him to be there when I walked up on this one. My dad was there when I shot my first buck as a 16 year old kid back in 1979. He always took vacation time from his job to take me deer hunting although he wasn’t a deer hunter himself. Having him there on the recovery was the final piece that made this buck so special. A couple of days later good friend Brad Davis measured Smokeys rack and came up with 206 6/8”. Indeed, I finally had my second 200”+ whitetail! NOTE – The video of this hunt will be posted on the Real World Wildlife Products website on Thanksgiving Day. You can see it there or go to either the Real World Wildlife Products or Don Higgins/Higgins Outdoors Facebook pages where links will be posted. Both of my books are available for purchase on this website. I personally sign each one before shipping. 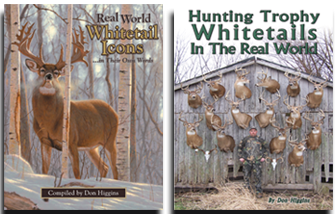 They make great Christmas gifts for the deer hunter on your shopping list! Previous PostIs This For Real??!! Congratulations Don on both harvesting such a buck and on helping to get him to see full maturity. It’s a great story and I’m very happy that you have been able to do it yet again. You give us regular guys hope.